Protectowire's Fiber Optic Linear Heat Detection System is a real-time temperature monitoring system consisting of Type PFS Fiber Optic Sensor Cable and PTS Series Controllers with related software. The PTS Series Controllers can be configured for various alarm criteria and connected to an approved fire alarm control panel using relay inputs and outputs. 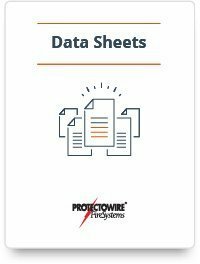 Download our data sheet to learn more about Protectowire's Fiber Optic Linear Heat Detection System.